Once again this international campaign is being supported by both NHS England and NHS Improvement and offers organisations the chance to celebrate the work that’s happening to improve experiences of care. They are inviting teams in Trusts, CCGs and care providers to engage and share work using various means such as digital technology and local face to face events during the week, to inspire and encourage others with examples of small and big things that are improving experiences for the people using and working in our services. They want to hear all about the amazing work being done in all areas of the health sector. They are encouraging organisations to hold their own staff events throughout the week, and will be hosting online activities including twitter chats and webinars. There will also be blogs to support the week and in the lead up to the week. The campaign is now live on the WeCommunities website here. There is also some really colourful, fun graphics to help promote the week which are downloadable here. 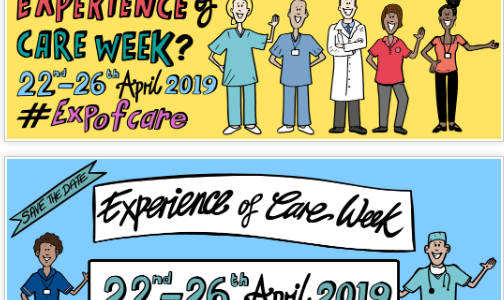 Social media is a key tool for bring Experience of Care Week to life, and we will all be using the hashtag #ExpofCare to capture tweets or key messages about what people are doing.